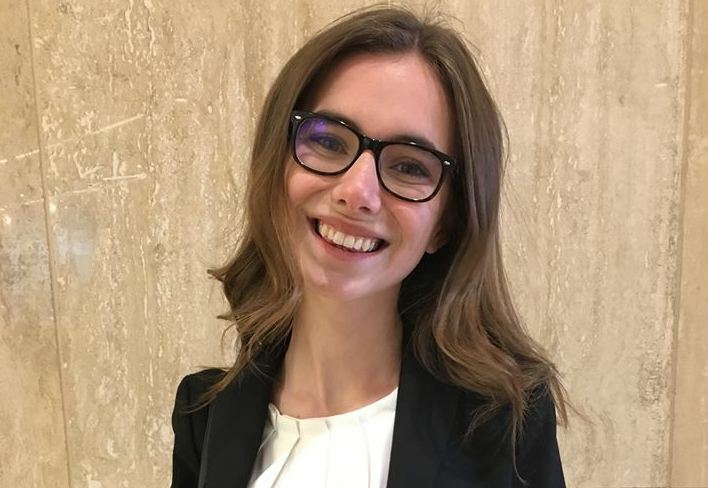 Lydia Ochs, a junior political science major, is interning at the political action committee EMILY’s List this semester. Photo from Ochs’ Facebook. Lydia Ochs, a junior political science major, is interning at Emily’s List in Washington. Emily’s list is an American political action committee that aims to help elect pro-choice Democratic female candidates. Ochs is part of Butler’s Washington D.C Learning Semester where students take classes on foreign policy, history and public art of Washington and earn credits while also being engaged in real-life internships with governmental offices and other agencies. The Butler Collegian: How is it moving to and living in Washington? What are some of the coolest things to do? Lydia Ochs: It is pretty cool going from Butler to D.C. There’s lots to do and I am still living in a dorm-style building, so that’s not that different. There’s 20 Smithsonian museums — there is definitely a museum for everyone’s interests because there are so many. There are a bunch of beautiful outdoor green spaces. My favorite thing is that there are tons and tons of really cool restaurants so there is always somewhere to go out to eat. There is a lot of music and theaters, too. TBC: What’s it like to be away from Butler? LO: It is definitely different being away from Butler, but being a junior I feel like a lot of my friends are also abroad or doing programs like this, so I don’t feel like I’m missing out on quite as much as if I had gone a different semester. When you’re looking at all your friends still on campus having fun, it would be kind of sad but because so many of my friends are away I don’t feel that as much. As a far as being away from home, I definitely miss my parents because I only live two hours from Butler. TBC: What drew you to Emily’s List? LO: Emily’s List was definitely my top choice. I think it is a little bit different than most Washington internships. It’s an organization that I support so that why it was my top choice. TBC: What exactly are you doing at Emily’s List? LO: I’m working in their marketing department which is related to a development area. Most of what I do is just fundraising and talking and communicating with our donors. TBC: How do you think this internship can help you later on in life? LO: I plan on working on campaigns, and this definitely allows me to learn a lot about how campaigns work and endorsements and fundings and things like that. I have volunteered and interned on actual political campaigns before, so it’s really interesting to see the other side of it like the money and the training. The endorsement side is definitely different than things I have learned in previous internships. TBC: Any interesting experiences you have had thus far? LO: I would say that Washington is just an interesting city; there is always just a lot going on. It’s also interesting being here while presidential announcements are coming out and candidates are being endorsed again to run in 2020. There is a lot of conversation about the election already. That’s always interesting to hear, like water cooler chat. TBC: How did your experience at Butler prepare you for an internship? LO: I think I learned some professional skills from classes and dealing with professors and also with some of my extracurricular activities. I also think my coursework prepared me in terms of writing skills and organization skills. The background knowledge for campaigns and politics that I got from my major has been helpful. TBC: What is different about the internship compared to Butler? LO: The department I’m working in is fairly outside of my major. Emily’s List does have a state and local department which is more closely related to politics but most of my classes have been focused on policies, and I’m working at a place that focuses on campaigns so that a little bit different. TBC: How is this internship different than other internships? LO: I would say that just because the mission of the organization is different. It is definitely a female-dominated work space and the focus of our work is on electing women. That is definitely different most other political work spaces, and that is something that I really like.